Analytik Jena`s SmartExtraction global innovation was awarded this year’s New Product Award (NPA) yesterday at the SLAS International Conference and Exhibition in Washington D.C. With this prize, the Society for Laboratory Automation and Screening annual meeting (SLAS) recognizes product innovations. Analytik Jena’s SmartExtraction technology competed against numerous product submissions. “I’m delighted with award. It’s a testament to all of our work,” says Ulrich Krauss, CEO of Analytik Jena AG. Krauss was also extremely satisfied with the trade fair and conference as a whole. “The week proved to be very successful. The atmosphere was exceptional, the discussions good.” The SLAS conference focuses on innovative products and processes in lab automation and liquid handling. SmartExtraction is a global innovation in nucleic acid extraction: The innovative technology does not require the use of phenol/chloroform, ion exchangers, filter columns, or filter plates, nor does it need suspensions of magnetic or paramagnetic particles to bind nucleic acids. The use of uniquely modified surfaces for the binding of nucleic acids (“Smart Modified Surfaces”) forms the basis of the technology developed by scientists at Analytik Jena. 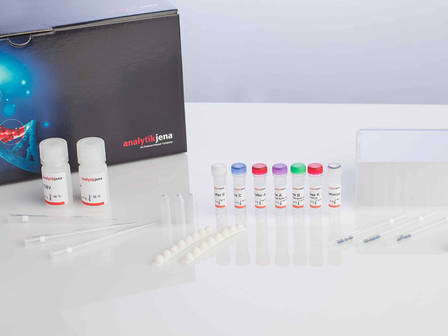 Analytik Jena offers a number of hardware solutions for the isolation of nucleic acids using SmartExtraction technology with its InnuPure® C16, InnuPure® C96, CyBio® SELMA, CyBio® FeliX, and GeneTheatre automation platforms. These range from partially automated extraction protocols (CyBio® SELMA) to fully automated extraction, which can then be combined with further process steps, such as a PCR setup (CyBio® FeliX, GeneTheatre).